Godzilla turned 50 with a new movie, Godzilla Final Wars, said to be the last because (s)he gets whacked, and a star on Hollywood's Walk of Fame. 50 years ago (s)he made his/her Japanese B-movie debut. " 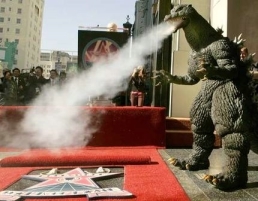 "Godzilla should thank you for this historical and monumental star," Godzilla Final Wars producer Shogo Tomiyama said ... "But unfortunately, he cannot speak English." EOnline interviewed Godzilla who responded as follows about a common sobriquet. E: Do you mind if I call you 'Zilla? Godzilla: I prefer God, to tell you the truth. [Laughs.] But seriously, Godzilla is the Americanization of my Japanese nickname, Gojira, and I never cared for it. Godzilla might want to be more careful in his/her advanced age, remembering all the headaches a similar answer caused John Lennon in 1966. The fundies are even more appoplectic these days. The scandalous interview also addreses what I punctuate above as Godzilla's gender ambiguity. N. Korea has a hacking ARMY?